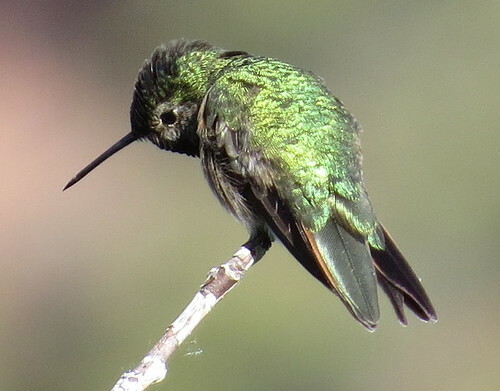 And though you wouldn’t know it from those pics, we did get to see both the purple collar on the Black-Chinned and the rose-red throat on a Broad-Tailed. The nature trail leads up into a Bear Canyon, which has some water and some fir trees; as we climbed up, we heard a repeated Pee-ee! call from across the wash. 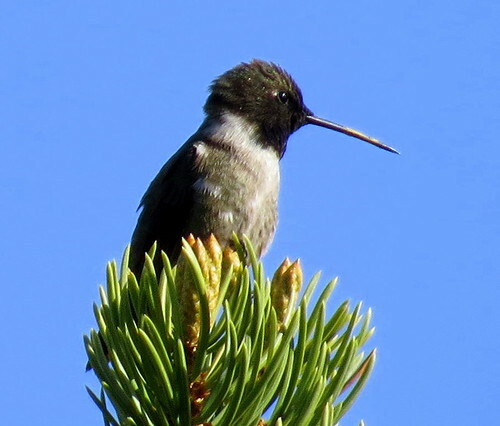 I spotted a bird in pine tree, and it was clearly an Empidonax flycatcher. Now, which one? It had a yellow belly and very short wing primaries. I played the Cordilleran call and it flew right over, but this bird’s call didn’t match. After a little more testing, we all agreed that the call was clearly Dusky. And the very short primaries are a good field mark for Dusky anyway. Another lifer! 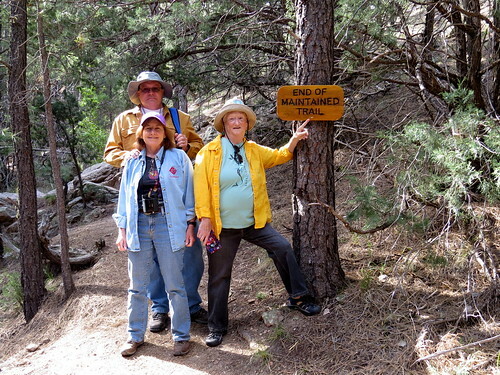 After the nature trail, we talked to a woman in the visitor center, who recommended the Santa Fe Canyon trail. It’s actually on Nature Conservancy property, and it goes up one side of the Santa Fe river and back on the other. 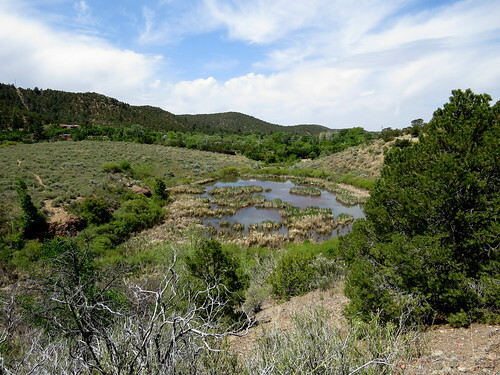 In the process it goes by a large pond that was once the reservoir for Santa Fe, as well as several beaver ponds. It was a nice hike, although we didn’t really see anything that noteworthy. After the hike we had lunch and rested a bit, then walked over to the Santa Fe Plaza and the Governor’s Mansion. 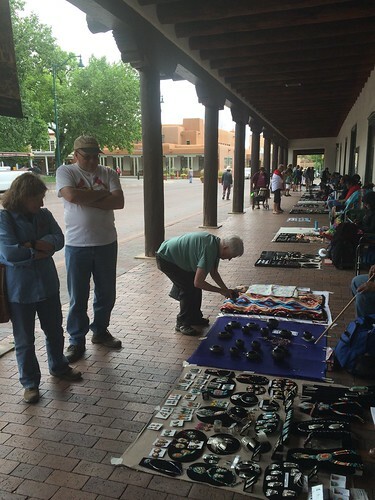 At the latter, a whole row of artisans had set up blankets with stuff for sale – always Robin’s downfall. We had a nice walk in the old city, and left much poorer. Tonight, tapas! This entry was posted on Tuesday, May 31st, 2016 at 5:49 pm	and is filed under Birds, Randall Davey Audubon Center, Santa Fe. You can follow any responses to this entry through the RSS 2.0 feed. You can leave a response, or trackback from your own site.